180 ft above the beach. A private rough hewn path takes 4-5 minutes to get to a beautiful snorkeling beach below. 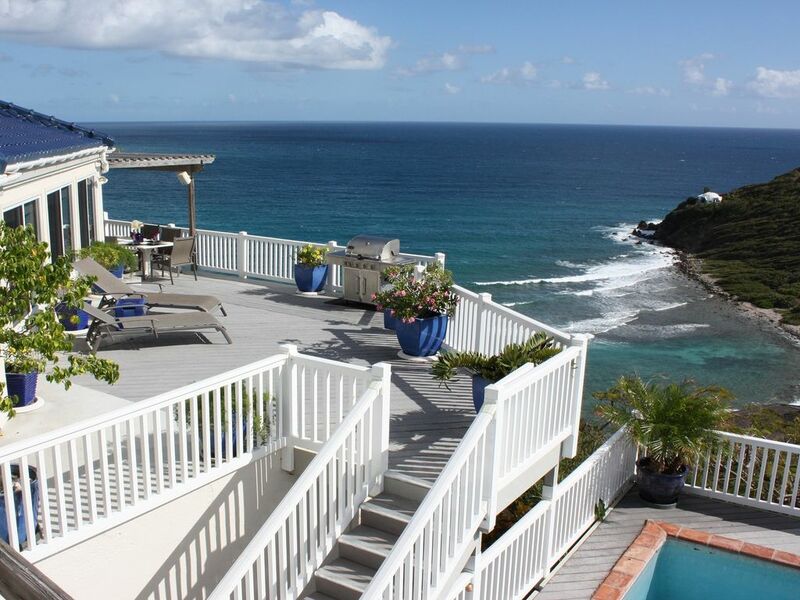 Unlimited local calls to all three US Virgin Islands on landline phones in the Kitchen, Great room and each bedroom. Quiet, Fast cooling, split system Air Conditioners in all three bedrooms. Large Capacity Front Loading Whirlpool Washer is located in storage room on the lower level for the exclusive use of the villa's guests. Large Capacity Front Loading Whirlpool Dryer is located in storage room on the lower level for the exclusive use of the villa's guests. Hi speed WiFi. Signal boosters throughout to give you optimum speed. Rarely, Internet service may be subject to brief interruptions beyond our control. Free WiFi available in town, in case of outage. We have an entire cabinet of herbs, spices and spice blends. No more running to the grocery for tiny ,overpriced packages of spice! At least 12 matched place settings. We have an assortment of matching linens to fit the mood you want to create. Our Kitchen is extensively stocked to satisfy the gourmet cook in you! We have everything from updated Stainless steel appliances, including a French door refrig/freezer w/icemaker; dishwasher; microwave; Capresso insulated carafe coffeemaker; Kitchenaid Professional Blender; Crema Cappuccino Maker; Ice Cream Maker; a full complement of professional Knives; Instant Hot Water Dispenser; Extensive spice collection. If cooking is your passion, we have everything possible to make your experience delightful! A separate indoor dining room surrounded on 2 sides by windows for a perfect view of the Sea. An outdoor, breezy, pergola shaded dining area serenaded by the constant sounds of the sea. (4) Besides the main TV in the great room, which has VCR, DVD, and Satellite hookup; each of the bedrooms has a flat screen TV with satellite and DVD hookup. We have a huge collection of popular books for beach and 'hammock' reading! We have an extensive collection of CD's in the Great Room. The Great Room Stereo is hooked to a surround sound speaker system that extends throughout the Great room, kitchen, diningroom, upper deck and pool deck. A hookup for your MP3 player is in place. There are a few Videos and DVD's at the villa and media of your choice can be rented from a store nearby. A Lush Garden filled with Frangiapani, Bouganvilla, Oleandar, Wild Orchids, Hibiscus and other exotic plants, welcomes you as you descend the stone steps to the Front Entrance. Andante has several areas of decks for maximum enjoyment of the sun, breezes, shade and view. On the upper level, there is a sun exposed main deck, with a separate dining deck and shaded pergola. The large sunny pool & spa deck has a pergola for shade as well. The master bedroom has its own deck facing east, and the west guest bedroom has a small private deck facing west. At the lower level, there is an expansive, totally shaded patio, with a hammock and seating. This area is the best for capturing the constant tradewinds, and is a guest favorite for a lazy afternoon nap. There is a separate small private patio partitioned off from the lower level in front of the lower bedroom. 12 ft x 20 ft. Graduated depth from 4 ft to 5 and 1/2 feet. The private pool and hot-tub are situated on a deck cantilevered into the hill for maximal views of sunset, sunrise and starry nights. A pergola at the northern end of the pool deck provides shade from the bright sun. Stupendous 270-degree sunrise-sunset views, A/C in bdrms, Satellite TV/70 channels Sat radio, Multi-;zoned Stereo piped to Greatroom, decks and pool, Hi speed WiFi CD-BluRay players for streaming music and movies effortlessly ; CD collection; Fax, Printer, Extensive library; Full Gourmet Kitchen with 'Instant Hot' water dispenser, Coffee Grinder/maker, Blender, Cappuccino Maker, Food Processor, Ice cream maker, Brand new Stainless steel appliances; All Cooking Utensils, spices, Stainless Steel Gas Grill (BBQ)for those perfect, 'No muss, No fuss' dinners under the stars, Indoor dining room/Outdoor trellised dining area, Linens, Private Hot Tub and Pool, Outdoor shower, Private decks off each bedroom, Lower level covered patio with hammock and breezes to die for!! Hike down a Path that winds down to secluded shell and coral Beach with the best snorkeling on the island. Fishing (on site) and Deep Sea fishing available. St. John is 2/3 National Park and cared for by the US National Park Service. Hiking trails, exploration of ruins, lovely beaches - both cared for by the NPS and more secluded off road ones - abound.